Minerals are substances that are formed naturally in the Earth. Minerals are usually solid, inorganic, have a crystal structure, and form naturally by geological processes. There are over 4,000 types of known minerals. A diamond is a re-arrangement of carbon atoms; those are also called allotropes. 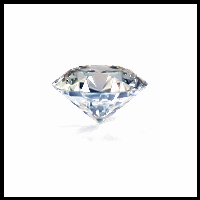 Diamonds have the highest hardness of any bulk/all one type material. Because of this, many important industries use diamonds as tools for cutting and polishing things. Many of them are clear, but some of them have colors, like yellow, red, blue, green and pink. Diamonds of a different color are called "fancies". 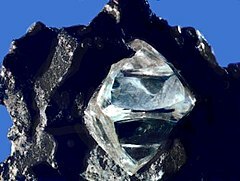 Diamonds are made of pure carbon, the same chemical element as graphite, fullerene, and coal. But diamonds are very hard and in crystalline form. Diamond's Mohs hardness– 10 Chemical formula– C Absolute hardness– 1600. Corundum is a mineral. It is very hard, with a Mohs hardness of 9 (diamond is 10). It is clear. Its chemical formula is aluminium oxide, Al2O3. Sometimes some of the aluminium atoms get replaced with chromium atoms. It then turns into ruby. It is a crystalline form of aluminium oxide with traces of iron, chromium, vanadium and titanium. Pure corundum is transparent, but on the other hand, it can have different colors when impurities are present. Corundum's Mohs hardness– 9 Chemical formula– AI2O3 Absolute hardness– 400. Topaz is a rock. It includes the minerals aluminium and fluorine with the chemical formula Al2SiO4(F,OH)2. Topaz is a silicate mineral of aluminum and fluorine and its crystal are mostly pyramid in shape. Pure topaz is colorless and transparent, but it is usually tinted by impurities. A typical topaz is yellow, pale gray, reddish gray or blue brown in color. A large amount of topaz is found in Sri Lanka, Germany, Norway, Nigeria, Australia, Japan, Brazil, Mexico and United States. Topaz's Mohs hardness-8, Absolute hardness– 200. 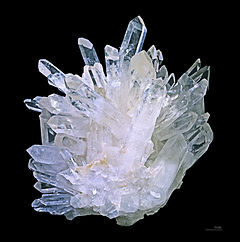 Quartz is the second most common mineral in Earth's continental crust. Its crystal structure is a framework of SiO4 silicon–oxygen tetrahedra. Each shares an oxygen atom oxygen with another tetrahedron, so the overall chemical formula is SiO2. 'Fused quartz' is glass made of silica in non-crystalline form. It does not contain other ingredients. These are usually added to glass to lower the melt temperature. Fused silica has high working and melting temperatures. The properties of fused quartz are superior to those of other types of glass due to its purity. Quartz's Mohs hardness– 7, Absolute hardness– 100. Feldspar is the name of a group of rock-forming minerals that make up as much as 60% of the Earth's crust. Feldspar forms crystals from magma in both intrusive and extrusive rocks, and they can also happen as compact minerals, as veins, and are also present in many types of metamorphic rock. Feldspar is also found in many types of sedimentary rock. It is a common raw material for the manufacture of glasses and some ceramics such as porcelain, and as a constituent of scouring powder. Feldspar's Mohs hardness– 6 Chemical formula– KAISi3O8 Absolute hardness– 72. Apatite is a group of phosphate minerals with high concentrations of OH−, F−, Cl− or ions, respectively, in the crystal. Apatite is a group of phosphate minerals, which is generally known as hydroxylapatite, fluorapatite and chlorapatite. Hydroxyapatite is the main component of tooth enamel and bone mineral. The primary use of the Apatite is in the fertilizer manufacturing as it is a good source of phosphorus. Apatite's Mohs hardness– 5 Chemical formula– Ca5(PO4)3(OH-,CI-,F-) Absolute hardness– 48. Fluorite is a mineral found in the earth. It has a chemical formula of CaF2. It is the main source of fluorine and fluorides. It naturally fluoridates drinking water in places where it is found. It barely dissolves in water. Fluorite is also a frequently occurring mineral – China, Mexico, South Africa are amongst the largest fluorite producing countries in the world. It's prime use is in optics, where it is used as window material. Optical lenses are also made up of Fluorite because of its low dispersion causing no or less chromatic aberration. Fluorite's Mohs hardness– 4 Chemical formula– CaF2 Absolute hardness– 21. Calcite is one of the most widely distributed minerals on the Earth's surface. It is a common constituent of sedimentary rocks, limestone in particular. It is also the primary mineral in metamorphic marble. One can find it as a vein mineral in deposits from hot springs, and in caverns as stalactites and stalagmites, most of which is formed from the dead marine organisms. One of the remarkable natural made Calcite structure is the Snowy river cave in Lincoln County, New Mexico. Calcite's Mohs hardness– 3 Chemical formula– CaCO3 Absolute hardness– 9. Gypsum is a common mineral, calcium sulfate. Gypsum has been used as a building material for a long time, possibly since the neolithic. Today, it is an ingredient of plaster. It can also be used as a fertilizer. Different forms of Gypsum are founded in ancient sculptures of Mesopotamia, Ancient Rome and Byzantine empire. Orbital pictures from the Mars Reconnaissance Orbiter indicated the existence of Gypsum dunes in the extreme northern region of Mars. United States, Brazil, India are among the top 3 countries with largest Gypsum reserves in the world. Gypsum's Mohs hardness– 2 Chemical formula-CaSo4 2H2O Absolute hardness– 3. Talc is a mineral, the standard for hardness grade 1 in the Mohs scale. Fingernail easily scratches it. Talc is composed of hydrated magnesium silicate with the chemical formula Mg3Si4O10(OH)2. Talc and pyrophyllite are very similar, but pyrophyllite may be slightly harder. Talc has a greasy feel and a translucent, soapy look. In loose form, it is the widely-used substance known as talcum powder. Steatite, also called soapstone, is a rock with a lot of talc. It is a common metamorphic mineral in metamorphic belts of western United States, western Alps and in Himalayan region. Talc's Mohs hardness– 1, Absolute hardness– 1.